I’ll keep this post as short and sweet as the granola recipe that follows. Lately, it’s been like my life (outside of work) has been sucked up by a vacuum. I had the entire summer to enjoy each of my hobbies, but with the start of the school year my free time has vanished. Lately I’ve been trying to make more time for myself. On the bright side, my students have been using a math strategy I taught them. I noticed them using it one morning when they were doing the problems of the day. It was like a light bulb went off in my head. Something stuck with them. Even the little things that are taught, stick with them. The feeling of seeing them use what they learned independently, was nearly indescribable. Until the next light bulb moment happens, there is always almond joy granola, which is possibly my new favorite granola recipe (and when I say possibly I mean definitely because anything almond joy flavored is amazing – unless you hate coconut and then it’s less than amazing, but I’m not one of those coconut haters and therefore it’s delicious). Mix together: 1 cup of rolled oats, the chopped almonds, and the coconut flakes. Then, in a separate bowl mix these liquid ingredients: 2 tablespoons of maple syrup, 1 tablespoon of melted coconut oil, and the almond extract. Add the liquid ingredients to the dry and mix until the oats are well coated. 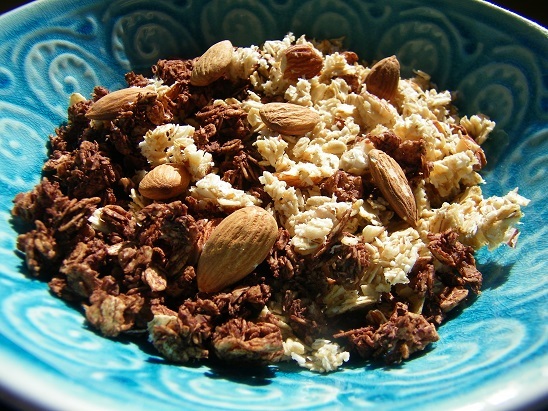 Mix together: 1 cup of rolled oats, the chopped walnuts, the coconut flakes, and cocoa powder. Then, in a separate bowl mix these liquid ingredients: 2 tablespoons of maple syrup, 1 tablespoon of melted coconut oil, and the vanilla extract. Add the liquid ingredients to the dry and mix until the oats are well coated. 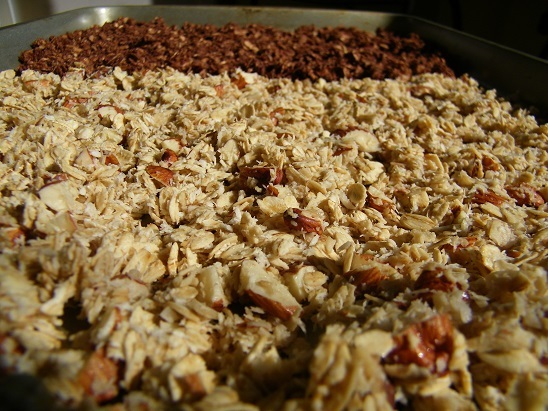 3- Add each mixture of granola to a baking sheet – keeping the two variations separate during baking (I put both on one baking pan, but kept the chocolate on one half and the almond granola on the other half). Bake for 12-15 minutes, or until the almond granola begins to turn golden brown around the edges of the pan. 4- Let the granola cool for about 25-30 minutes before serving with your favorite type of milk. Store in an airtight container. 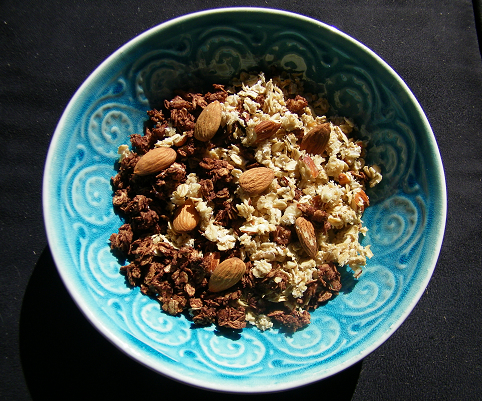 When I made this granola it lasted for about 4-5 days in an airtight container. Enjoy! Hello, I’ve been wanting to make granola for when I get the munchies and I like your ingredient list but maybe I’m missing something here.. I can’t find the method for making this granola! Thank you and I’ll check out your website!